New York is the concrete jungle where dreams are made and let’s face it, those dreams are best when covered in condiments and lovingly nestled between two slices of bread. A mecca for carb loaders the world over, you haven’t done New York until you’ve lunched like a New Yorker. Here is our list of seven sandwiches (by sandwiches we mean all of the delicious carbs) you need to try the next time you’re in the Big Apple. 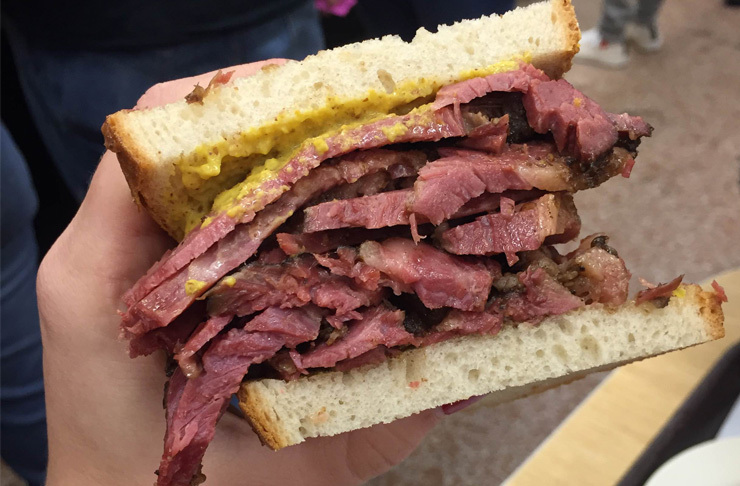 New York’s Jewish Delis are an institution in their own right and it’s unlikely you’ll find one as famous as Katz Deli nor a sandwich as notable as their Pastrami on Rye. Grab your ticket, choose your cutter and hope they give you a sample of pastrami while you wait for your sandwich to be carved and plated up right before your hungry eyes. The place where Harry Met Sally and the home of pastrami on the Lower East Side, the meat literally melts in your mouth like butter and when you pair it with their Every Bite Mustard and a serve of their house pickles your buds will want need more. A New York institution since 1914, these guys have served up a whooooole lotta bagels in that time, and will be, hands down, the best bagel of your life. Yes, the best. Not only is the bagel itself the fluffiest of bagel goodness (you can choose from plain, poppy, sesame, onion, pumpernickel and for those who can’t make a choice, the everything), but the fillings, are drool-worthy. First things first, cream cheese and we’re not talking about just the one kind of cream cheese, we’re talking goats cheese, vegetable tofu, caviar and several other types of cream cheese along with 12 different types of salmon, like pastrami cured or Scottish smoked. 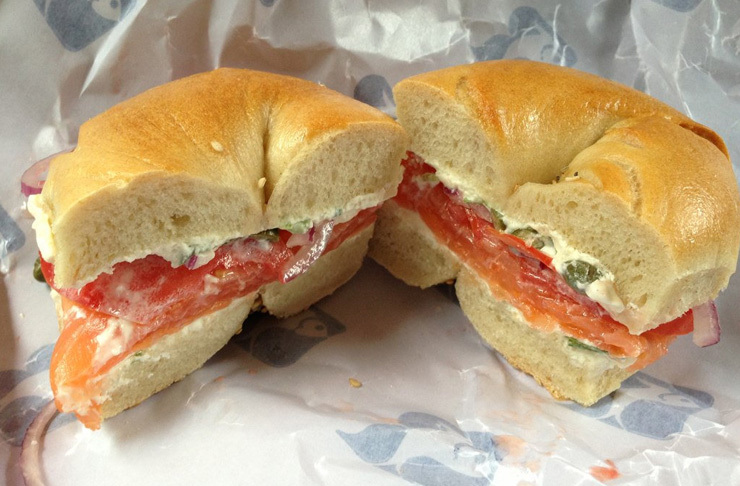 It’s then up to you to choose your flavour and create your own epic, life changing (no, really) bagel experience. 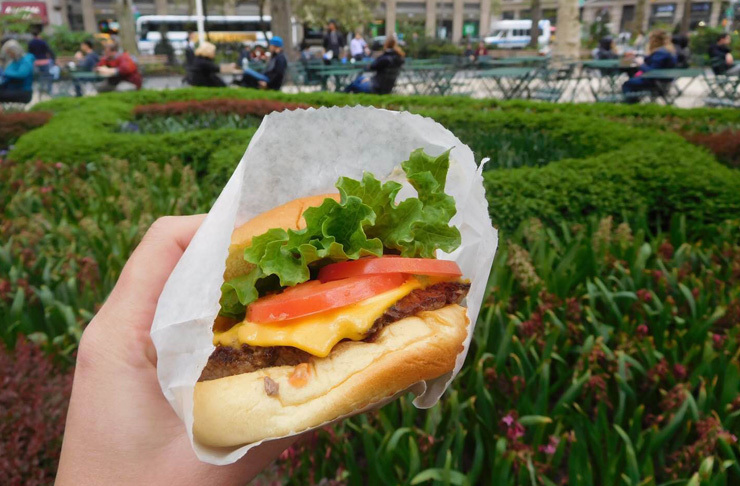 Sitting proud and tall, like a culinary oasis at the end of a long day of tourist monuments, Shake Shack in Madison Square Park is the original location of the hot dog cart that started it all. Lovers of a good cheeseburger, you know the ones where the bun is soft and squishy, layered with just the right spread of condiments for the appropriate amount of mayo/ketchup drip and paired with crispy fresh lettuce and juicy tomato, well lovers, behold the ShackBurger. It’s not greasy or overwhelming HUGE like some burgers in New York can be and goes perfectly with their crispy, crunchy fries. And guys, FYI, it’s located right near a dog park and with doggie snacks on the menu you can watch puppies all afternoon with no judgement from us. 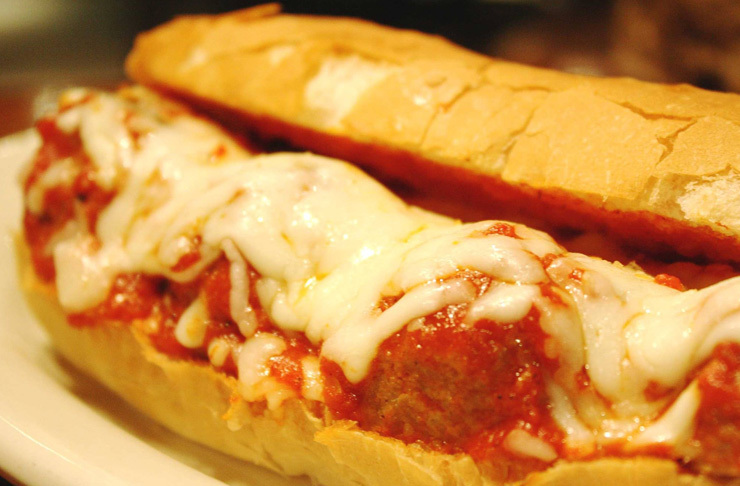 These guys were voted the best meatballs in Brooklyn and it isn’t just mama’s homemade meatballs that are worth getting excited about, although the hot Filomena sandwich served with their homemade san marzano tomato sauce and mozzarella cheese is all kinds of epic there’s something for every sandwich lover at this local deli. Like when you want to eat all the meats you can’t go past The Boss with capicola, soppressata, Italian ham and prosciutto or add in some chicken with the Cuz’in Nick. There’s also vego options and turkey or tuna if that’s more your flavour. 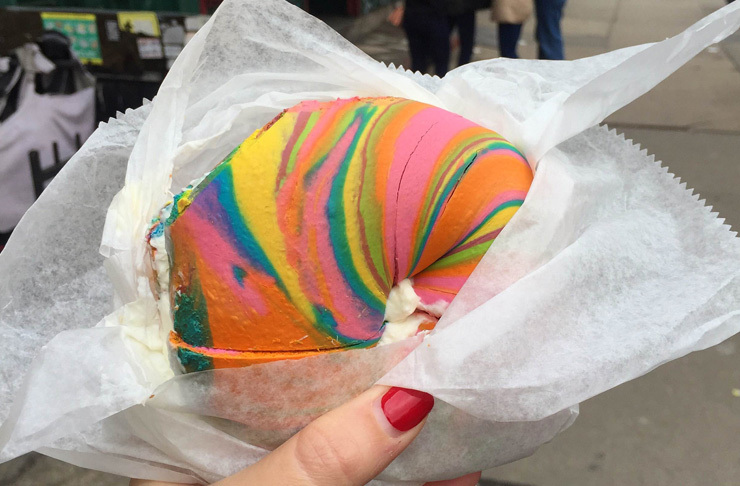 It went viral for a reason and that reason is not just all the glorious colours of the rainbow, it’s because it is one damn good bagel. For the full rainbow bagel experience make sure you pair it with a good slathering of funfetti or birthday cake crème cheese, because this is officially your cheat meal and you might as well go all funfetti or go home. There’s also homemade tofu spreads, light and regular crème cheese options and old faithfuls like Nutella and PB&J for round two. 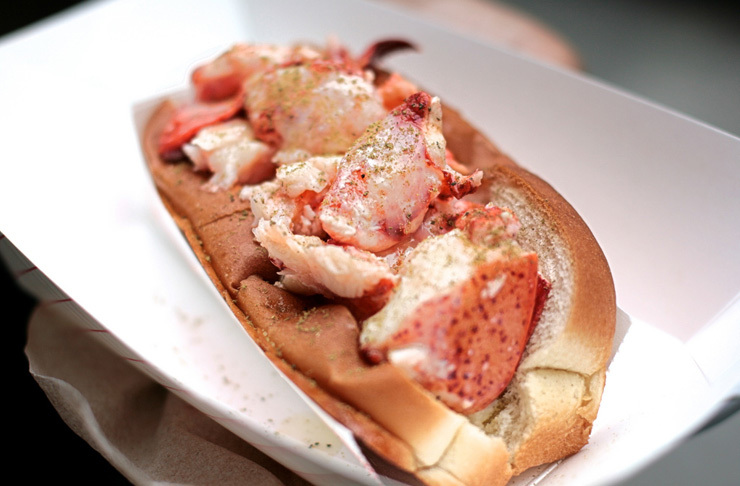 Lobster Rolls are a definite thing in New York and Luke’s Lobster is constantly labelled one of the best. Serving it up Maine style, meaning you can expect it chilled on a buttered and toasted bun, with mayo, lemon butter and their secret spices, this is one sandwich your buds will thank you for and one you’ll be back for. 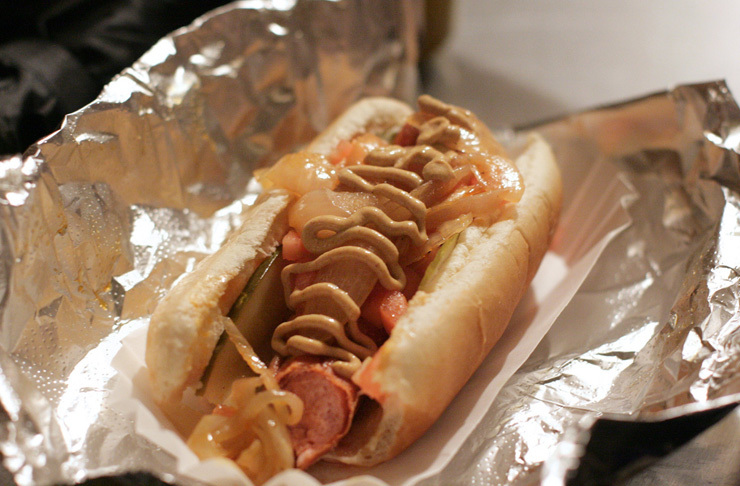 Get NYC’s #1 weiner in your gob at Crif Dogs in Brooklyn. They’re the perfect sized hotdogs with a bun that isn’t all sugar and a sausage you could eat and enjoy all on its own. It’s the kind of place that’s especially perfect if you like it hot with their spicy red neck, wrapped in bacon and garnished in chilli, coleslaw and jalapenos as well as their famous chilli dog with their secret chilli sauce. Travellers be warned, true to their retro feels there’s no wifi but there are some old school video games and 16 dogs to work your way through, so make like their counter sign says and go old school, call your mom (or write her a letter), if for nothing else than to tell her how amazing your hotdog tastes.